How can you tell the difference between oregano and marjoram? There are more than fifty kinds of oregano, and marjoram is just one kind. The genus name is origanum – all marjoram is oregano, but not all oregano is marjoram. Sweet marjoram (Origanum majorana) is just one variety. While I was on Kaua'i island we had the delightful privilege of unlimited access to what was locally called "Mexican oregano" which had leaves bigger than our hands. It was easy to harvest, and rich in the chemical component that makes oregano taste like oregano – carvacrol. With a little research, I have found that it would be more accurate to call what we had there "Cuban oregano." Or perhaps it would make the most sense (since Kaua'i is a Hawai'ian island) to just call it "Hawai'ian oregano!" This photo (below) is one I took while I was there. In the upper left of the photo you can see a plant with purple on the undersides of its leaves. That is an edible green plant called Okinawan spinach. The pointed green leaves with ruffled edges are a kind of mint. The variegated leaves (white on the edges and green in the center) that are somewhat rounded are the Cuban oregano. This photo was taken in my friends' greenhouse. The Lamiaceae family – the mint family – includes oregano as well as basil, mint, thyme and sage. All of these plants are easily recognized by their square stems and opposing pairs of leaves. They also have whorled flower spikes. This (below) is a photo of one of the many mints I have growing in my garden. In the upper right of the photo is giant clover which I intentionally seeded in many places in my garden to prevent the grass (the horrible weed!) from coming back. Recognizing marjoram in particular isn't easy. The color of the blooms isn't definitive, although marjoram tends to have white blooms, where oregano tends to have pink blooms. Oregano and marjoram cross very easily when grown together, which means you may end up with some new half-marjoram variety any year. I've read that the calyx is the only definitive way to tell, which is that little swelling just below the petals of a flower; the petals appear in many cases to be growing from it. In some cases, as is often the case with oregano, the calyx is well developed and looks more interesting than the petals themselves. When you buy your oregano, keep in mind that the original label when you buy the plant may not be correct. Just because it was labelled when you bought it doesn't mean they knew for sure either. I've bought some "sweet marjoram" – but I'm unconvinced that it is actually marjoram, particularly now that it has been in my garden for a year among many other members of the mint family. Also, sweet marjoram often doesn't live through the winter, not being as hardy as oregano, so I may not even have it anymore. Here is some oregano from my garden (below). In the upper right of this photo you see some strawberry leaves of the ever-bearing variety (whose berries taste like strawberry jam) and on the left of this photo you see a dandelion leaf growing through the fuzzy oregano. This particular oregano variety is disappointingly mild, clearly very low in carvacrol. In this next photo you can see more of the whole plant. 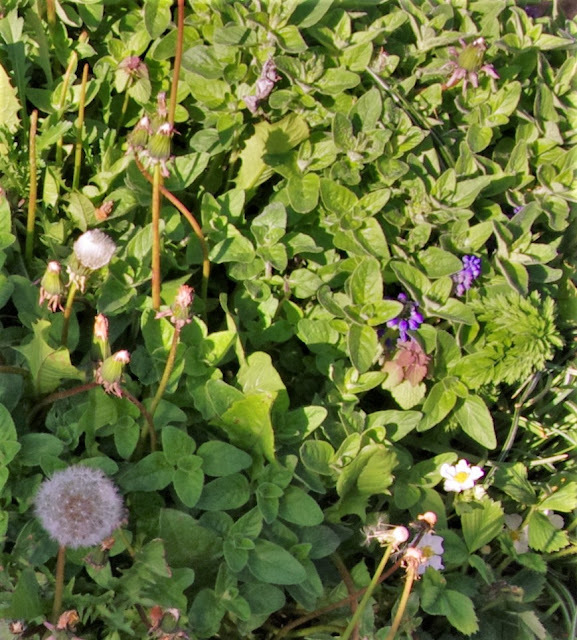 This photo was taken in late April, so the dandelions were out in force, and the yellow-and-white blooms (in the lower right of the photo) are strawberries-to-be (which I've already eaten and enjoyed at the time of writing this). The bright purple flowers to the right of the photo are grape hyacinths, a small bulb. There is also a dead-nettle beside/below the purple grape-hyacinth bloom. This, by the way, is my idea of permaculture – no monocrops for me! If you want to be sure for culinary reasons, sample all your different oregano plants in your kitchen side-by-side with dried versions from the grocery store. See if you can learn to detect the flavor of marjoram well enough that you recognize it in the fresh version. That is probably the most useful way. Even if you never do discover what sorts of oregano you have by name, you'll at least find out what sorts of flavors you have growing which will help you decide how to use them. I've found this process particularly helpful with all of my varieties of thyme. I have one thyme variety that tastes more potently like oregano than more than half of my oregano varieties. 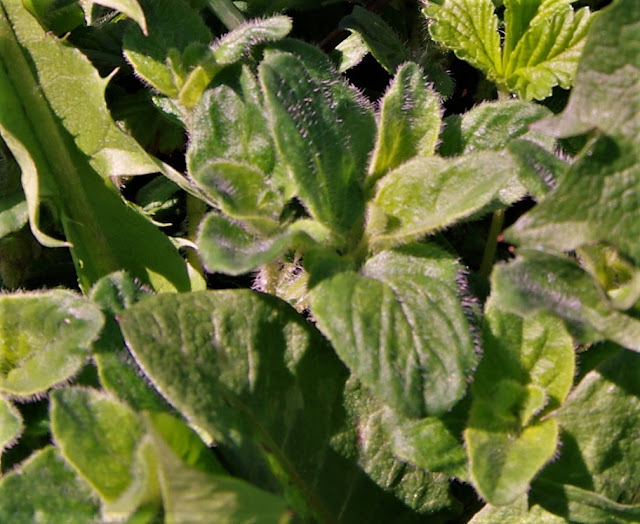 In this last photo (above), you can see wooly thyme int he center of the photograph with its tiny, fuzzy leaves. In the lower right is wild, very-tasty purslane growing over and up the rocks. In the upper right is one of my many oregano varieties. The colorful purple accents in this photo are sedums growing up through and around my thyme. 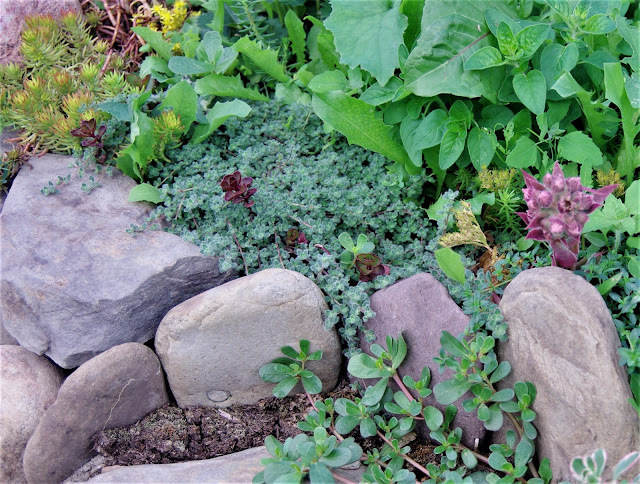 The yellow stuff in the upper left of the photo is also a variety of sedum (which are not edible, but they're hardy and gorgeous). You can also see some dandelion and lamb's quarters in the upper (mostly toward the right) portion of this photograph. Wooly thyme (Thymus pseudolanuginosus) is one of my favorites to grow because you can't get a plant any more low-growing this this tiny plant. It show-cases small flowers and plants (such as sedums and crocus) that are grown around/in it. It is difficult to use woolly thyme in a salad because taking those little leaves off the tough stem is no fun, but it is great in juices made with a masticating juicer (such as an omega vert or the more traditional omega juicer). It also is delicious in teas. I recommend growing things of similar height together. Otherwise you'll learn the hard away that tall oregano will easily overtake your woolly thyme . . . in time! (Okay, I know that wasn't that funny.) Thyme is hardy enough to tolerate it for a while, but sage is more easily over-taken and sun-starved. Because of the inter-breeding of these plants, I recommend spacing your oregano, mint, sage and thyme with other perennials such as strawberries, lilacs, comfrey, shasta daisies, hostas, and so on, keeping plants of similar heights together in the same bed. Strawberries make great companions for any of these herbs. Comfrey gets rather large, but can make a decent companion for oregano or mint. Rock pathways can also be used as a separator between herb plots, but, of course, in a garden with many varieties of mint (in the general sense), interbreeding will eventually occur, given enough years. Enjoy the process and taste all your herbs again each year to rediscover and remind yourself of what you like each herb for.